Now for anyone who really knows a lot about chiles rellenos, this might be a total sham. But this is such a great summer option. Fire up the grill and enjoy a great summer treat. Poblanos are one of my favorite peppers. They’re not really spicy, but they have such a powerful flavor. Plus the interesting way of making the chicken, really adds a lot of moisture and flavor. Preheat the oven to 375 degrees. Take the two chicken thighs, season them with generous amounts of salt, pepper, chili powder, garlic powder and adobo seasoning. Take the tomato and puree it in a blender or food processor. Take an oven safe skillet or pot with a lid. Add the milk, butter and tomato. Heat over very low heat, just to warm and melt the butter. Add in a tsp of salt and a pinch of chili powder. Keep stirring occasionally until heated and the liquid becomes almost a salmon color. Place the chicken thighs in the pan with the tomato and milk mixture. Put in the oven for about 20-25 or until the chicken thighs are done. Luckily thighs cook pretty quickly. Take the poblanos and make a circular cut around the top, and pull out the stem and the seeds. The results should be a hollowed out pepper. Take the cooked chicken thighs and start shredding the chicken with a fork. When done, add the chicken to the bowl with the cotija cheese. (leave a little off to the side for a topping later) take the chicken and cheese mixture and stuff the poblano peppers. Make sure they’re really stuffed to the brim to make sure you get the maximum amount of cheese and chicken. When stuffed, grease the outside of the poblano peppers. Sprinkle with salt and wrap in aluminum foil. Grill the peppers for 6-8 minutes or until soft, turning the peppers occasionally. Top the peppers with some refried beans and extra cotija cheese. Enjoy!! Hi everyone! it’s been awhile since my last post, but I’m back with some spring recipe ideas! The weather is warmer… and apparently that means my recipe block is over. I thought I’d start with a sweet side you can bring to any spring picnic. These carrots can be served hot or cold, so you don’t have to worry about them sitting out. They’re also super quick and easy to make. Place the carrots in a large saucepan with a lid. Fill the pan with half an inch of water. Season with salt and pepper. 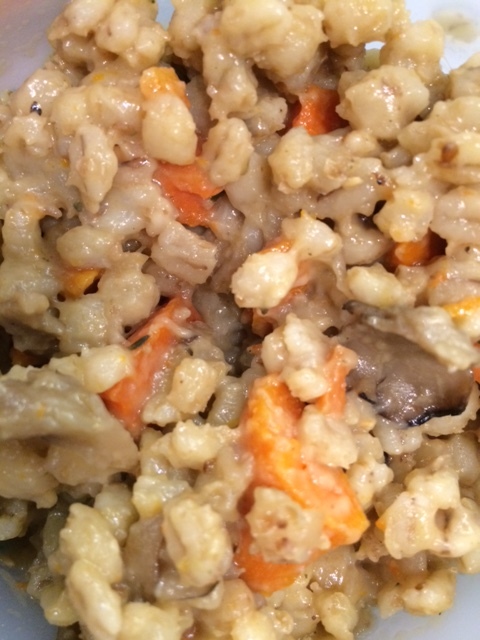 Turn your stove on high or medium-high and let the carrots steam u ntil soft. (This takes roughly 10 minutes, but continue to check every few minutes so they cook to your desired softness.) Add more water if needed. When tender, drain any remaining water. Add the olive oil, honey and a few healthy dashes of thyme (or sprigs if using fresh thyme). Sauté the carrots until glazed. Enjoy! These carrots will be a hit at any summer party or cookout! 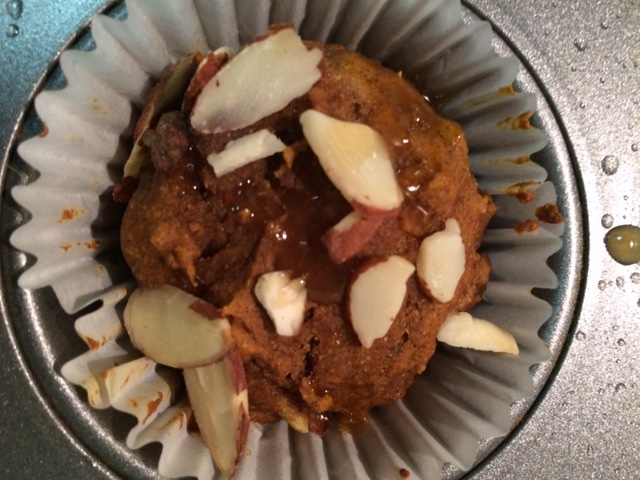 I’m on a big almond kick right now, and loved the idea of getting a nice crunch in the middle of a muffin. And since it’s fall… let’s make it pumpkin! They’re only 85 calories a muffin! 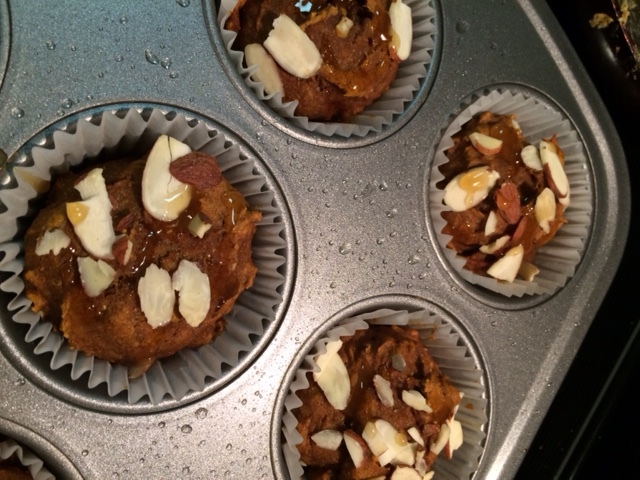 If you remove the honey and almonds and decide to do a plain pumpkin muffin, it’s only 65 calories each! 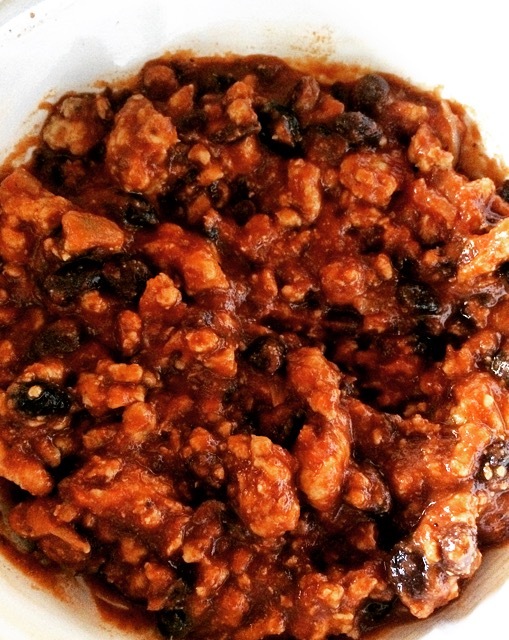 In one bowl, combine the pumpkin, sugar, egg, vanilla extract, honey and apple sauce. blend together. In a separate bowl add the salt, nutmeg, cinnamon, baking soda, baking powder and whole wheat flour. Add the wet and dry ingredients together. DO NOT OVER MIX. Over mixing will make these too dense. Fold in the sliced almonds. Evenly distribute the batter in the muffin tray. (you don’t have to, but I used cupcake wrappers. If you don’t, just make sure you grease the pan.) Bake for about 18-20 minutes, or until you can poke a toothpick into the muffin, and have it come out clean. Drizzle the top of the muffins with honey.